Last fall we sent out an email about our camp Internet Policy. As part of our Partners In Parenting program, we felt that in light of recent events in the media, we wanted to draw your attention back to the issue of cyberbullying, and the latest effects it’s having on children today. New laws are being created and passed across our country to help protect our children, but as you know, being well informed is the first step in helping to protect your child. If your child is like most in today’s society, they probably are spending quite a bit of time on a cell phone or instant messaging (IM’ing, texting), chatting with friends and uploading photos, videos, and music to various social networking websites (Facebook, Formspring, Twitter…etc.) They may have online “friends” whom they’ve never met in person, with whom they play games and exchange messages with. Children’s lives exist in a variety of places – at home, camp, school, organized sports, and at friends’ houses. But now, many of them also have lives that exist on the Internet, and as such, bullying has followed and found its place online too. Online bullying, also called “cyberbullying,” happens when children use the Internet, cell phones, or other electronic devices to send or post messages or images intended to hurt, torment, threaten, harass, humiliate, or even just embarrass another person. Cyberbullying is a problem that affects almost half of all American teens beginning as early as 9 yrs old. 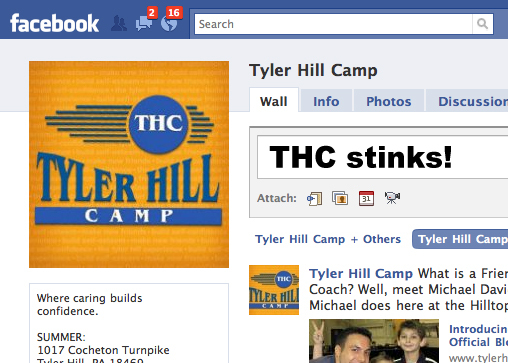 At Tyler Hill, we go to great lengths to protect your children while they are at camp and under our care. We want to share with you some information on how to be able to help protect your children while they are at home too. Below are some links that we think you may find helpful in arming yourself with the knowledge of what cyberbullying is, recognizing the signs if your child has been a victim, and what you can do to help prevent it. Associated Content – Watchful Parenting – Can Parents Prevent Cyber-Bullying?